Clé Verte® is a voluntary environmental certification program that offers automobiles service shops (cars and light- or heavy-duty trucks) recognition of and appreciation for the environmental measures they have implemented. 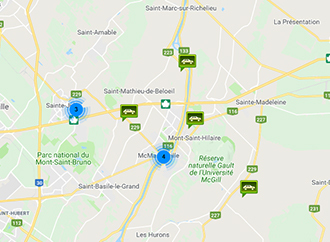 The Clé Verte® program was created in close collaboration with partners from Table de concertation sur l’environnement et les véhicules routiers du Québec at the request of the automotive industry. Nature-Action Québec, a non-profit organization known for its quality environmental services, developed the program and has been managing it since the very beginning. Join the 800 automotive service shops that have been certified to date! And shop owners say it again and again: CLÉ VERTE certification profitable! The initial certification is valid for a two-year period. Subsequent certifications are valid for three years. To register, you must send in a copy of the registration form along with your payment. Upon receipt of your documents, a visit will be schedule to train the program manager(s) at your shop. From then on, you will have a maximum of 18 months to implement the various measures proposed and comply with the requirements of the CLÉ VERTE standard. Get certified now (registration form)!